A small collection of Solar and Radio Control models all featuring similar functions with the exception of the far left Citizen Satellite model. Whilst it receives a Radio signal too, it’s from a satellite orbiting the Earth and not a ground based transmitter. I just love a Radio group photo as they all show the exact same time! And the time is – the same on every darned one – Exactly! Forgotten the prices now, without looking them up when I got them, but I know the dearest is on the far left and the cheapest in on the far right. But they all have pretty much the same accuracy. The Citizen Satellite model however has the most accurate quartz movement, out of the box, without any synchronization, but give them light (yes they are all Solar Powered) and automatically pick up a signal every day – they all read the same time – precisely. 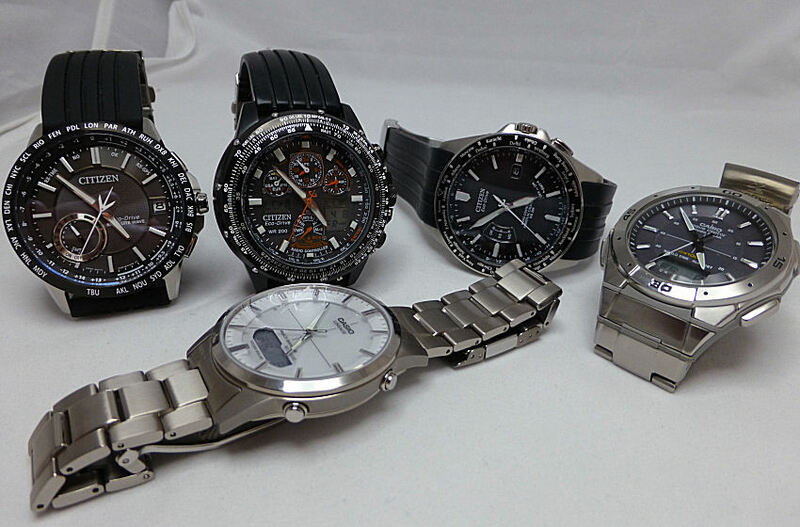 Note the smallest watch in the group is the light dial Casio LCW-170 at just over 39 mm diameter. It is also the slimmest at around 9 mm depth. Don’t ask which one I prefer because I like them all. They each do exactly what they’re supposed to do and do it very well. I have no issues with any of them and they are proudly what I call – my Estate models – that is they will be here long after I’ve gone and no doubt someone else will have the pleasure of owning and wearing them.